Unique Astrology gift book gives humorous insight into Cancer personality. Click Here! 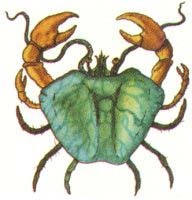 The Sun awakened Cancer the Crab, a feminine sign in the zodiac on your birthday. The Sun in astrology stands for your inner nature, your essential character. The fourth sign of the Zodiac, Cancer is ruled by the restless Moon. Click this to test your compatibility with all signs, or check out these signs, the most compatible for relationships with Cancer! Physical fitness or sports activities can become important ways for you to work out emotional stress. Team sports are fun, for you can adopt team members as part of an extended family. Swimming, fishing, sailing and other water activities attract you, along with skiing, ice skating, and mountain climbing. Cancerians are creative. Even those among you who may not have any particular talent can use some involvement with art, music, or writing as another method of emotional release, rather than indulging in eating binges or other destructive habits. Living or spending time near the water is a relaxing, as well as creatively stimulating environment for Cancerians. Cancer rules the stomach, diaphragm, upper liver and breasts. People with Cancer active in their charts are subject to coughs, indigestion, gas, gallstones, general problems with stomach, liver and intestines, plus emotional disorders such as depression, hypochondria and hysteria. Ideal colours for the Crab are white, silver, and pale yellow. Cancer rules metallic silver, while both the ruby and the pearl are the traditional Cancerian birthstones. Silver reflects its environment in its shiny polished surface, yet it can tarnish and become dull unless properly cared for. In the same way, your sensitive nature reflects the people and circumstances surrounding you. The precious ruby, a variety of corundum, is one of the hardest minerals known, while the pearl is soft and easily scratched. Here we have the two contrasting sides of the Cancerian personality: hard and determined, yet simultaneously soft and vulnerable. 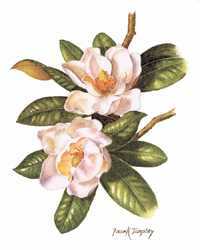 Cancerian flowers are the water lily (lotus), iris, white poppy, white carnation and southern magnolia.